Your car may be a perfect companion, but it too needs some tools and accessories to stay up and running whenever you need it. 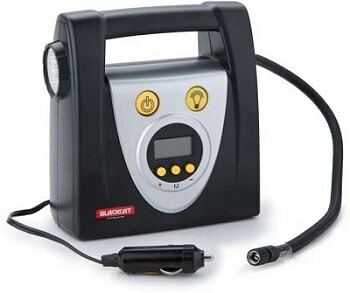 Either in your garage or inside the car, your toolkit must contain one tyre inflator for those inevitable situations. A mechanic may not always be just a call away and you might have to take things in your hands. Puncture and even low pressure need an instant attention, and, in those situations, you might want all your tools, including the tyre inflator available immediately. 1) Packed with loads of features, this tyre inflator can make the tedious task of inflating tyres a lot easier and faster. 2) The company has included a feature that can auto cut-off the machine when the pre-set desired pressure level is achieved. 3) It takes just three minutes to reach the optimum pressure level from zero, plus the motor is also very silent while working. 4) There is a large LCD display alongside the control buttons and an LED light is also present for using it in the night. 5) This inflator comes with a 12-feet chord that can help inflate all the tyres without having to move to the machine itself. 6) You can power the tyre inflator using the power outlet of the car or the cigarette lighter. 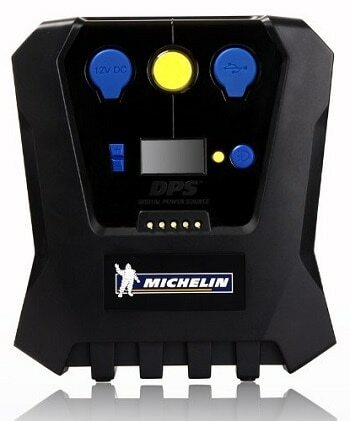 1) For inflating your vehicle’s completely flat tyre, this inflator from Michelin has a built-in rapid function that takes just a couple of minutes to do its job. 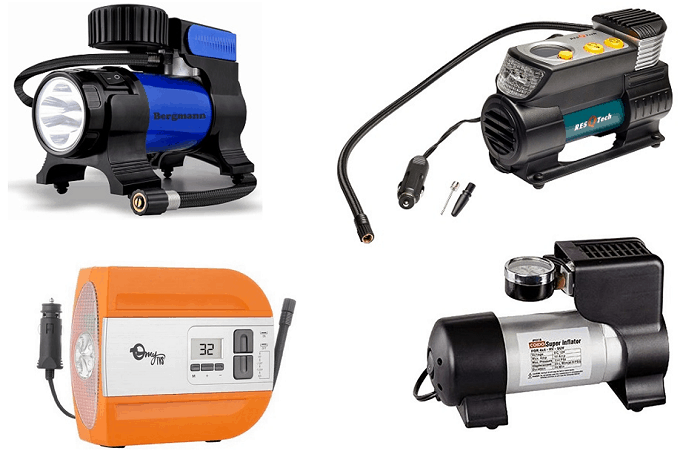 2) With its wide range of 0 to 50 PSI, you can make use of the inflator with a variety of needs and if you have different kinds of vehicles, this inflator will come handy in those cases as well. 3) It has a fully adjustable pressure level that you can pre-set before inflating the tyre. 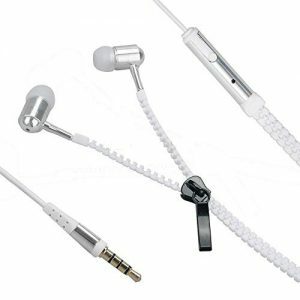 With its fairly long chord, you can easily reach all the corners of your car. 4) The inflator draws its power from a 12V power outlet, so you can provide it from your car and if your scooter has one, then it will work too. 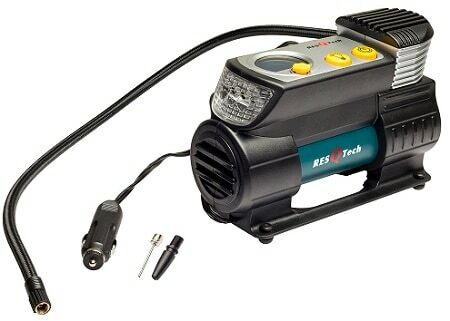 1) This is a heavy-duty tyre inflator that works better than those mini inflators. 2) Bergmann claims that its inflator can fill a normal tyre at zero within two minutes, which is much better than most others. 3) On the front, a bright LED light has been placed for your help when working on the dark. 4) The company has used a powerful 150W motor made out of copper for best performance. 5) A pressure gauge has been included in this inflator that ensures a high precision, so you don’t need to buy a separate one. 6) It is easy to maintain inflator and comes with a 3-metre long braided cord, which is just fantastic. 7) Anti-vibration feet have also been included in this device for a proper use. 1) Made of high-quality material, this tyre inflator is perfect for keeping inside your car. 2) On the front, you will find a digital display that will show the necessary information along with some control buttons. 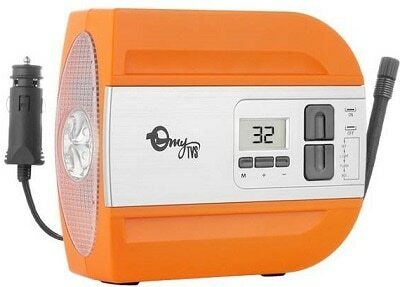 3) It has a large and bright LED light on the top which can be controlled from the button on the front. 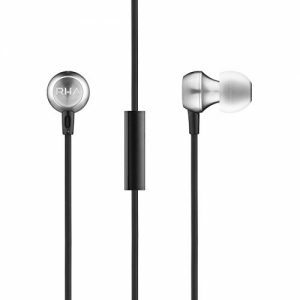 4) It has a detachable cord and the air pressure monitor. 5) You can use this inflator to fill the tyre up to the optimum pressure level within three minutes from zero. 6) The maximum pressure this inflator supports is 100 PSI, making it one of the most cost-effective tyre inflators on this list. 1) For a versatile usage, this tyre inflator can be used to inflate items like balls, rubber rafts, rubber bathtubs, and of course tyres within minutes. 2) This is a 12V inflator meaning you can use it with your car’s power outlet and it is small enough to place inside your car. 3) The company has included a multipurpose adaptor inside the box for using it at different places. 4) Compared to mechanical pumps, this one can be much easier to use and completely inflate the tyres within a few minutes from zero and topping up a tyre will take less than a minute. 5) A pressure gauge has been included so that you don’t have to buy a separate one. It can measure a maximum of 300 PSI pressure. 1) This portable little tyre inflator can easily fit inside your car and could come handy in case you need it in an unlucky situation. 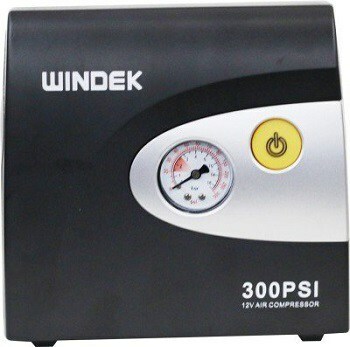 2) While being ideal for most vehicle types, this inflator can make your car reach the required pressure within minutes using its 10 Amp motor. 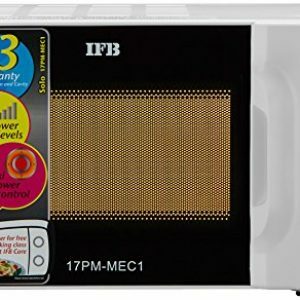 3) It is a digital inflator and comes with the display on the control panel placed on the front. 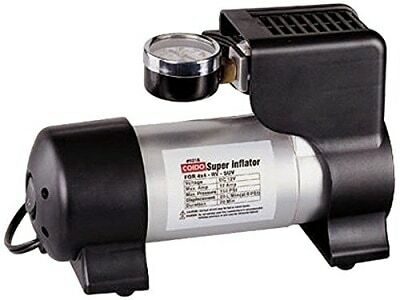 4) With the included cut-off feature, the inflator will stop as soon as the desired pressure is reached. 5) For your convenience at night, there is a bright light included in the machine that sits on the front to provide a proper angle. 6) A long chord means you can move it around your car without having to unplug. 1) Unlike most of the other tyre inflators in this list, this one is an analogue machine. 2) With a maximum pressure of 300 PSI, it has a pretty powerful motor that can run at a maximum current of 10A. 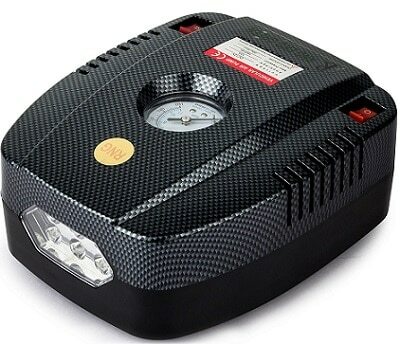 3) Being a 12V tyre inflator, you can easily use it with the car’s power outlet without any hassle. 4) It can fill a normal tyre within seven minutes and it is pretty easy to use too. 5) Besides the analogue dial to check the pressure, there is a single power, which is the only one you’d need to operate this inflator. 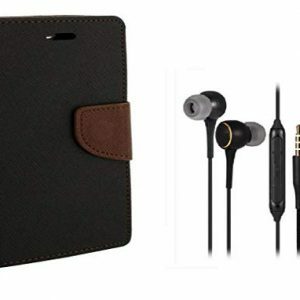 6) It is a great value for money device in the market. 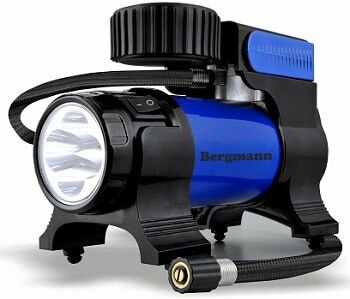 1) A very compact looking tyre inflator comes with a Kevlar-like finish from the outside, giving it a rugged look. 2) It is a high-power machine that offers a pumping speed of 35 litres per minute while being extremely silent when working. 3) The company has included some extra attachments with this inflator for being used with stuff like air mattresses, toys, balls, etc. 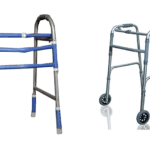 4) You don’t need to invest time in its maintenance every day and it has an oil-less design. 5) There are cavities on the back to hold the air pipe as well as its long chord in their place. 6) There are a couple of buttons on the front to control the unit and the LED light sits on the top for an easier usage. 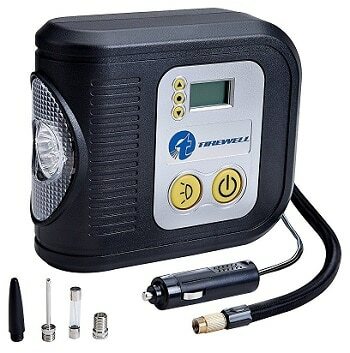 1) Bright from the outside and extremely functional from the inside, this tyre inflator makes it handy to work with the tyres in case of an inevitable situation. 2) At max, this inflator can go up to 80 PSI, which is way more than what normal tyres need. 3) You can fill a normal tyre from 0 to 32 PSI within 2 minutes, as the company claims. 4) The wire size is 3 metres allowing you to move around your car.Its design allows you to roll the chord and the pipe around it to have it stores safely. 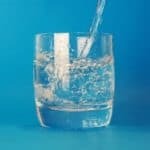 5) At the front, you will find a digital screen for showing the pressure level along with a few control switches to adjust the settings according to your need. 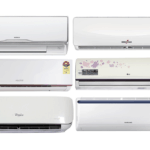 6) You will get a 2-year warranty with this product. The auto cut-off feature will come handy so that the tyre isn’t over pressurized. 1) Another compact yet functional tyre inflator in this list comes from Black Cat which supports digital features like a modern machine would. 2) There is a digital screen on the front couple with a few buttons to adjust the settings and turn on/off its LED light, that sits on the side. 3) On the other side, its chords and pipe can be folded and safely placed inside the cavity meant for it. 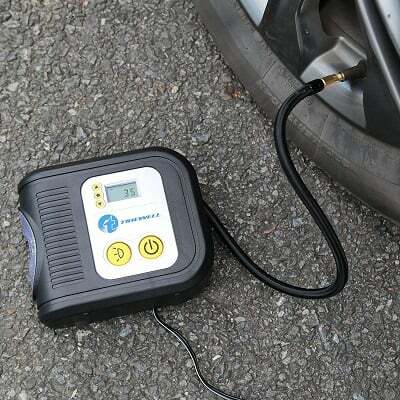 4) With its maximum capacity of 100 PSI, you can fill your car’s tyre within a few minutes of running it. 5) Refills and regular maintenance of the tyres are even faster. 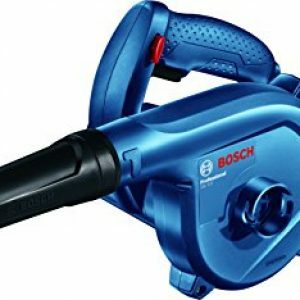 Auto shut-off feature is supported by this inflator and you can pre-set the desired pressure level and this machine will take care of the rest. 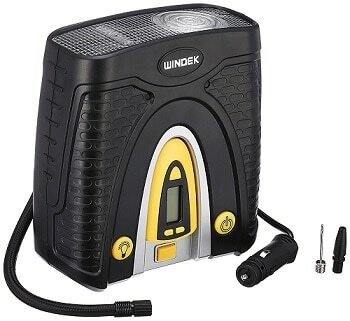 6) On purchase of this tyre inflator, you will get a warranty of 1 year from Black Cat. Note: Most of the car tyre inflator’s pressure gauge are not reliable and might show inaccurate readings. To avoid this we recommend Michelin MN-4203 tyre gauge. 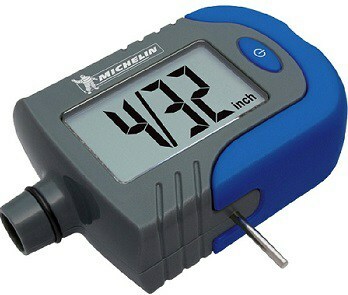 It can measure pressure in psi, bar, and KPI. Also being a digital one , the readings are more accurate then a analog tyre gauge. It can also measure tyre tread depth in mm and inch.